Since I stopped eating wheat, one of the things I miss the most is pizza. It is easy to find substitutes for some glutenous foods, like pasta and cereal… but I have yet to find a gluten free pizza that replicates the qualities of a sourdough pizza (and whoever eventually invents this will quickly become a millionaire!). 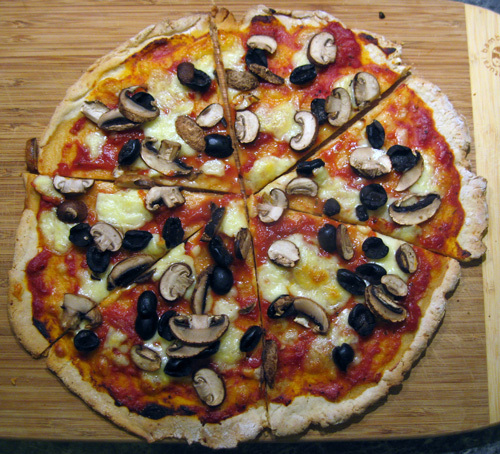 However, there are many gluten free pizza dough recipes available, and after experimenting with a few, I’ve created one that is similar to a traditional thin-crust pizza. Nothing will ever compare to a New York style pizza, but for those of us who can’t partake in wheat, this gluten free dough recipe make a slightly chewy pizza that hits the spot when you having a craving for pizza. Even if you are completely eliminating gluten from your recipes, it is important to understand gluten’s role in traditional baking if you want to make edible gluten free baked goods. Gluten is a protein found in certain grains (including wheat and rye) which acts as a binder and thickener, and, unfortunately for some people, it is the key ingredient for making chewy and fluffy bread and pizza. At a molecular level, kneading dough develops gluten, creating a mesh-like structure that makes the dough elastic and gives it the ability to rise by trapping carbon dioxide. The amount of gluten in flour affects its texture: bread flour has more, while pastry flour has a lower gluten content. Xanthan gum is a common ingredient in gluten free baking. Made from corn, it mimics the structural properties that gluten provides in flour. Be sure to measure precisely, as a little bit goes a long way – ¼ teaspoon can change the outcome of a recipe! Once you have followed an exact recipe that uses xanthan gum, you can start to play around with quantities to achieve different textures, but be aware that too much can give your baked goods a gummy consistency. Some people have trouble digesting corn products, so an alternative to xanthan gum is flax seed. When ground and mixed with an equal amount of water, it creates a gooey slurry that also acts as a binder in gluten free recipes; whole flax seed will not work, so it is essential that it is finely ground, which you can do with an electric coffee grinder or using a mortar and pestle. I have only recently started to play around with using flax seed slurry as a binder, but it is my understanding that you can substitute equal amounts of xanthan gum for ground flax seed (measure it dry, then add water), and vice versa. An added benefit of flax seed is that it is rich in fiber and omega-3 essential fatty acids, and has been found to provide numerous health benefits like lowering cholesterol, reducing inflammation and preventing certain types of cancer. Venturing into the world of gluten free baking can be a bit intimidating at first, what with all the numerous foreign ingredients (buckwheat flour, tapioca starch, xanthan gum…?! ), so start slowly; a pre-made gluten free flour mix and some flaxseed or xanthan gum should be enough to start experimenting with. Once you feel comfortable with these, you can start investing in individual types of gluten free flour. Anyways, enough with the science behind dough – grab a gluten free beer and enjoy some pizza! Making Gluten Free pizza is slightly different from traditional pizza: instead of putting the sauce and toppings on raw dough, gluten free pizza bases need to be partially cooked before topping them. Preheat your oven to 225 C/ 440 F. Put a pizza stone or a large baking sheet into the oven so it will get really hot. Mix the milk and water in a jug and heat in the microwave until luke warm (about 45 seconds) – it should feel warm when you test a drop on the inside of your wrist. Stir in the yeast and honey, and set aside for about 5 minutes, to let the yeast reactivate. You are basically waking up and feeding the yeast; the warm water and sugar help with this, but be careful not to use hot water, as it will kill the yeast! Your yeast mixture should develop a layer of foam after a few minutes – a sign that the yeast is alive and ready to work! Mix the ground flaxseed with 3 teaspoons of water, making a slurry. Let this sit for a few minutes, until it becomes gooey. Lay some parchment/baking paper on the counter and dust liberally with gluten free flour. Roll a ball of the dough out to form a 12″ circle that is approximately 1/8” thick; you want it to be fairly thin, as a thick base will be really heavy tasting and un-pizza like. Get the pizza stone/baking sheet out of the oven and sprinkle lightly with cornmeal (this helps it from sticking and gives it a nice texture too!). 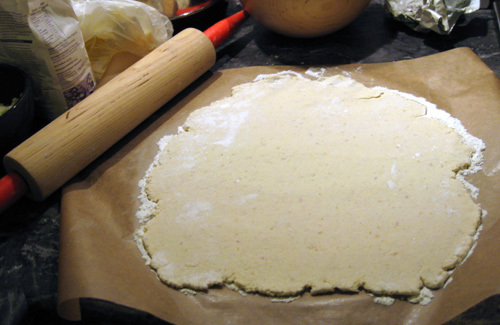 Transfer pizza dough to prepared baking sheet/stone and bake until slightly golden, approximately 8 minutes. 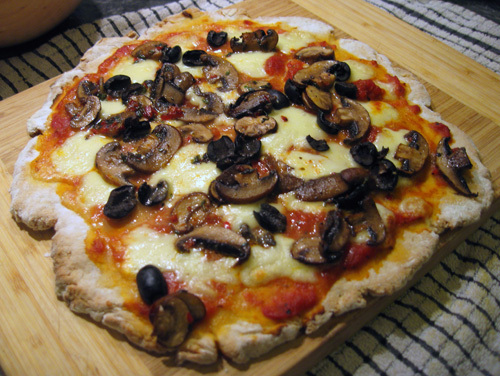 Watery sauce = a soggy pizza, so make sure to cook the sauce until it has thickened properly! Combine all ingredients in a small saucepan and simmer on low heat for 15 minutes, or until the sauce has thickened. Use a spoon to break up the tomatoes, creating a smooth sauce. Cool for at least 15 minutes before using on pizza. I’m glad you stopped by! I haven’t posted in a long time, but hopefully will resume posting in the next month or two once my life settles down a bit. In the meantime, I hope the rest of the recipes and info is helpful and please feel free to contact me if you have questions about CF. Good luck with going gluten free! Your GF pizza crust really does look fantastic. I do believe you just became the hero of a whole wide world of people living a GF lifestyle! I’m sharing your post on my FB page today. Thank you so much for linking up to “A Little Birdie Told Me…”!